Each month we host a Graphic Novel Book Club meeting, open to all, during which we hang out and informally discuss a featured graphic novel. 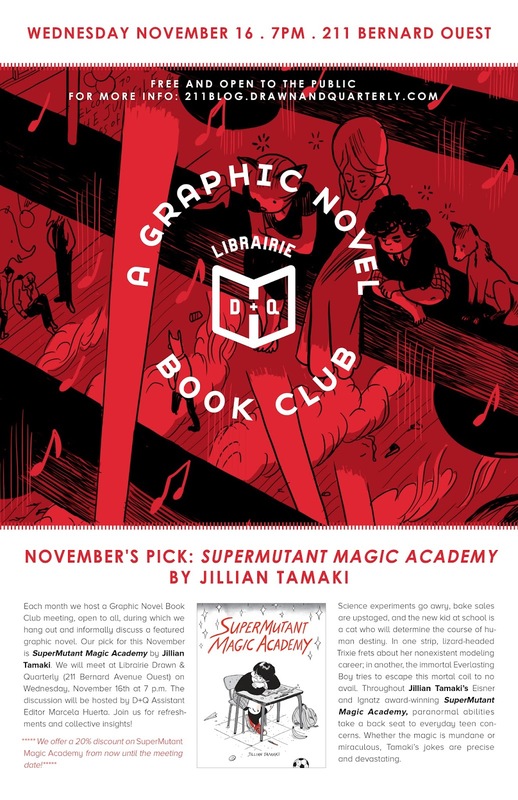 Our pick for November is Jillian Tamaki’s SuperMutant Magic Academy! We will meet tonight, November 16th at 7:00 p.m. at Librairie Drawn & Quarterly (211 Bernard O). The discussion will be hosted by D+Q assistant editor Marcela Huerta. Join us for refreshments and collective insights! **We offer a 20% discount on SuperMutant Magic Academy from now until the meeting date. Science experiments go awry, bake sales are upstaged, and the new kid at school is a cat who will determine the course of human destiny. In one strip, lizard-headed Trixie frets about her nonexistent modeling career; in another, the immortal Everlasting Boy tries to escape this mortal coil to no avail. Throughout Jillian Tamaki’s Eisner and Ignatz award-winning SuperMutant Magic Academy, paranormal abilities take a back seat to everyday teen concerns. Whether the magic is mundane or miraculous, Tamaki’s jokes are precise and devastating.